Although many of the residents of Norka engaged in agriculture and the associated milling business, there were also those who made their living through other small scale commercial practices. The colonists brought with them many trades and skills learned and practiced in their German homelands. The ship arrival records from 1766 and the 1767 census show the following occupations were practiced by settlers in Norka: farmer, teacher, bookbinder, stonemason, wheelwright, tailor, weaver, shoemaker, and stocking maker. Many other settlers who were simply listed as craftsmen. Germany had a long tradition of guilds which originated in the 12th century. Guilds operated on a system where a young man first worked as an apprentice learning the basic skills of the trade. After the apprentice attained a certain level of knowledge and skill, he was promoted to journeyman. At this time, he was allowed to travel the land in search of masters in his field for whom he could work and from whom he could learn the requisite skills to become a master himself. When he completed his journeyman time with appropriate skill and knowledge, he would be promoted to master. This was an important step which allowed him to set up his own shop. The Russian recruiters recognized the value of the skills learned by members of the guild system and the benefits they would bring to the development of the new colonies on the lower Volga. 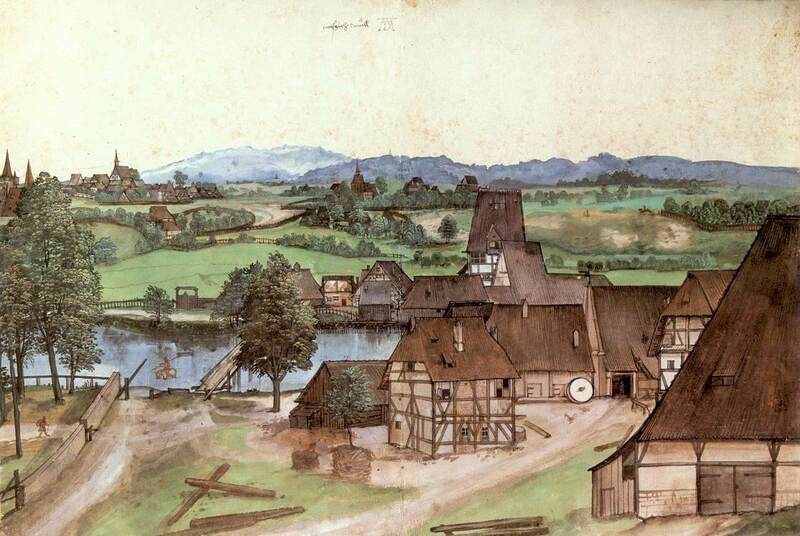 "The Wire-drawing Mill" a watercolor by Albrect Dürer about 1489 in Germany. Source: Wikimedia Commons. At the time the 1775 census was taken, living in the colony were blacksmiths, a cooper, silk weavers, a camlet weaver, mill operators, a tailor, a shoemaker, a watchmaker, and a wheelwright. The 1798 census notes the existence of two mills, three blacksmith shops, and four shoemakers. A variety of crafts and skills were needed for the colony to survive and thrive. While many of these skilled workers provided materials for the local population, over time certain products were marketed outside of Norka. Two men from Norka, J. Deines and W. Spady, manufactured sarpinka (a cotton cloth) which they displayed at the 1862 International Exhibition in London, England. The sarpinka business employed many people in Norka. Beginning in the 1880s, winnowing machines, or Putzmaschines as the colonists called them, were also manufactured in Norka. The Volga German winnowing machines became so well known that the term "kolonist" was commonly used to describe the machines and it was often burned onto the side of the machine to improve its marketability. 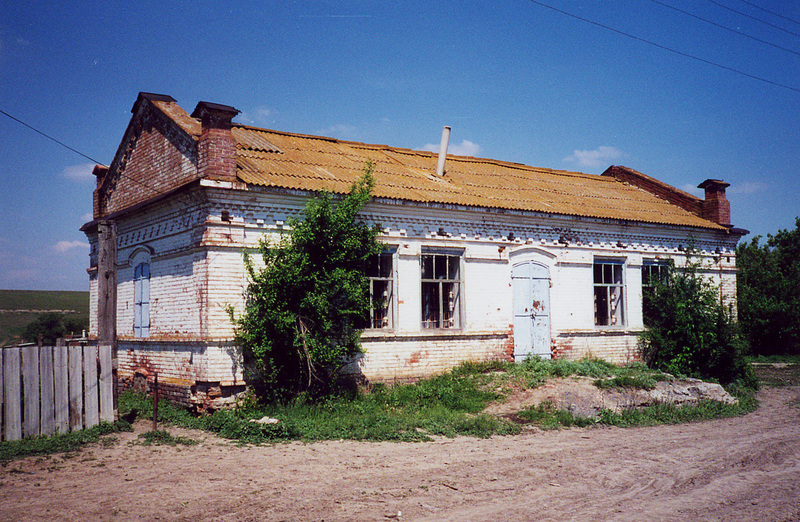 Many businesses relied on the port colony of Schilling which had sawmills, hotels, grain elevators, flour mills, restaurants, and barge facilities for transporting goods on the Volga River. Balzer was another important commercial town where spinning and weaving products were predominant. 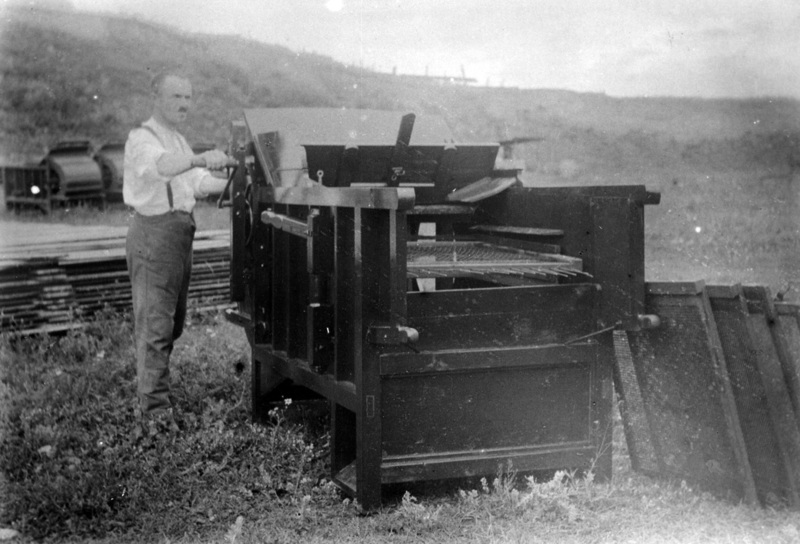 Volga German "Putzmaschine" or winnowing machine. Source unknown. Most of the villagers were farmers . . . almost every village had a supply of blacksmiths, wagon makers, shoemakers, carpenters, and various other laboring people who weren't interested in farming for themselves, or may have used the farming for a part of their livelihood, along with a trade. There were actually people, who sold their "dusch" (share of farmland) to people for cash, or had it farmed for shares and they did work for others. Brill's brother-in-law was known as Reiche (rich) Schleuning (also Schleining). Alexander Schleuning (born about 1900, died in 1941) was reportedly one of the richest men in Norka in the early 1900s. In addition to farming his large land holdings with 25 teams of horses, he also owned a mill, the Lafka (a general store), orchards, and vegetable gardens. Alexander married Olga (Olinde) Schreiber. They were deported to Siberia in 1941 and Alexander died there that same year. Heinrich Liehl (also Lehl) was nicknamed Rote Schintler, meaning he was a redheaded and a coat maker. Lehl was known through most villages as one of the best leather coat makers in the colonies. Heinrich would be called to the best homes, where he stayed until he finished making the great coats for all family members, receiving free room and board, plus good wages for his work. Johannes Pauli (also Pauly) owned a brick making factory along the roadway of the Norka Grava (ravine). Bricks were made of materials on the site, and were mixed by two large paddles connected to a merry-go-round affair built into a round tank about 16 feet in diameter, and pulled by a horse. The brick mix was poured into brick forms, sun dried until hard enough to handle without breaking, then placed into racks in open silo type bunkers about sixteen feet wide and eight feet deep. They stretched in length about a city block. There were several bunkers of this size and they burned up a lot of waste in the bake process. When they were in the bunkers and ready to bake, the men piled any burnable materials into the pit, and set it afire. After the bricks were baked properly, they were so hard it took a hacksaw type saw to cut one in half. When baked they were stacked in neat rows along the roadway for sale. The rows of bricks stretched for blocks. Pauli was born May 25, 1861 and married Katharina Christina Schwindt. Julla Spady was the son of successful doctor who died and left a large sum of silver coins to his heirs. With this capital, Julla opened a mercantile store in Norka. Merchandise to stock the store shelves was unloaded from barges in the port colony of Schilling. Conrad Brill recalls hauling seven wagon loads from the barges to Norka that included "everything from toothpicks to farm implements." Conrad Brill also shows a Schleicher Mercantile on his 1920's map of Norka. Building on the first row said to have been a store. 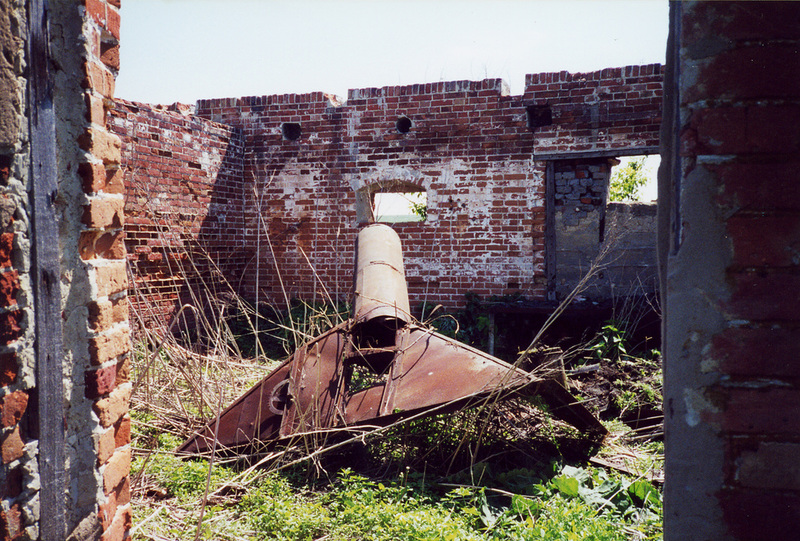 Photograph courtesy of Steven Schreiber (2001). A man with the Spitzname (nickname) of Schneider Hahn operated a tailoring shop and another called Gerver (tanner) Faigler ran a local tannery. Faigler was a big employer, and at different times of the year they hired as many men as the owner of the largest flour mill hired. Mr. Faigler was considered a generous employer who gave schnapps breaks and a good noon meal to his employees. Another story tells of a man named Schwartz who went to America and returned to Norka with "a bundle of money" which he used to start a mercantile store. Although he had made a lot of money in America, he reportedly didn't like the fact that it was "a woman's world." By 1885, over 50 percent of the adult males living in Norka were working in non-farming trades and crafts. In 1898, A. N. Minkh reported that there were 54 enterprises in Norka including: 6 windmills for grain, 6 oil mills, 5 tanneries, 7 joineries, 11 shoemaker shops, 5 tailoring shops, 11 blacksmith shops, 11 stores (lafka) and 5 taverns. Minkh also reports that by 1887 about 547 people were engaged in various trades, including: 89 hired men, 2 coopers, 13 fullers, 6 bricklayers, 16 tanners, 39 blacksmiths, 78 wheel-wrights, 19 millers, 9 (sheepskin) fur-dressers, 20 shepherds, 2 bookbinders, 7 sawyers, 14 carpenters, 19 tailors, 25 shoemakers, 1 locksmith, 28 joiners, 6 watchmen, 36 weavers, 28 traders, and 10 saddle-makers. Among trade and manufacturing enterprises owned by the settlers there were 3 stores selling manufactured produce, 6 stores selling trifles, and 4 stores selling wine. Those who emigrated often took their entrepreneurial skills with them to the New World. Ludwig Deines operated a hauling business using sleds during the cold winter months to transport goods. Ludwig immigrated to the United States where he settled in Portland, Oregon. In Portland, he used the skills learned in Russia to start a garbage collection service which became very successful over time. Johannes Pauli's son, John, immigrated to the United States in 1907 and operated a successful business in Portland, Oregon. By the time of the First World War (1914), there were 24 business enterprises and 14 shops and trading houses in Norka. 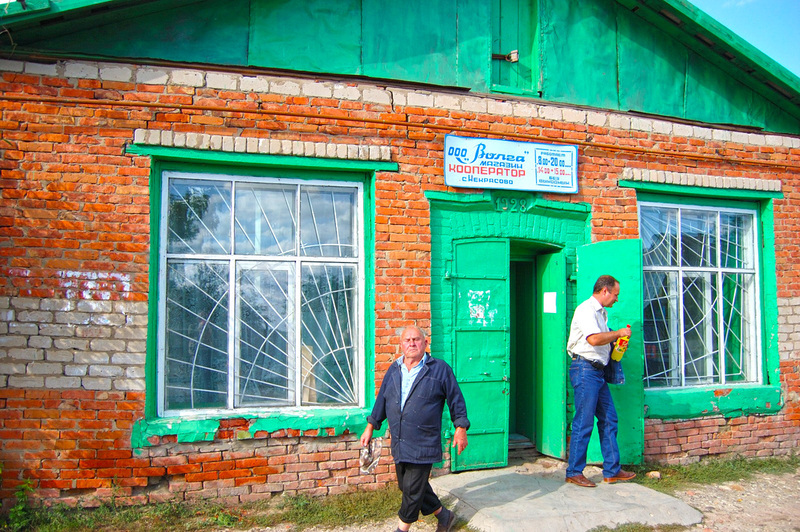 A "Lafka" or general store in Norka that was built in 1928. This photo was taken in September 2006 on visit to Norka by Steve Schreiber. The tour guide is to the right and a local citizen is shown to the left. The remains of a blacksmith shop to the south of the bridge leading to Huck, Balzer and Dönhof. Courtesy of Steven Schreiber (2001). Long, James. From Privileged to Dispossessed. Lincoln, Nebraska: U of Nebraska, 1988. 68,151. Print. Minkh, A. N. History and Geographic Dictionary of Saratov Province. Saratov, 1898. pp. 688-691.